No experience necessary. You have an experienced team behind you who will truly be there for you each step of the way. 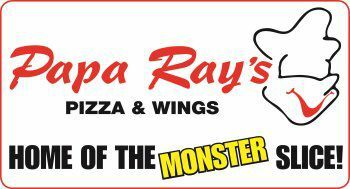 What advantages are there in owning a Papa Ray's Pizza Franchise? The demand for pizza by American consumers continues today as never before. Our product line and efficient store design developed from our experience enhances your ability to capitalize on the demand. You gain the benefit of our experience and buying power from day one. Can I convert an existing pizzeria into a Papa Ray's Pizza? Yes, but we may require some new equipment and the pizzeria will need to be adjusted to look like a Papa Ray's Pizza. If I already own a pizzeria, why would I want to become a Papa Ray's Pizza Franchisee? You can reduce your cost of goods, share in cooperative advertising in some areas, and benefit from our name recognition. By joining us, you can take advantage of our volume purchasing power with vendors to lower your cost of ingredients. You can capitalize on our advertising system both in your locality, and in the greater area served by Papa Ray's Pizza Franchise. Do you allow partnerships if I don't meet the financial requirements alone? Yes. Each partner must submit his or her own Application and Financial Information Sheet. Does Papa Ray's Pizza Franchise Pizza require its franchises to be owner-operated? Yes. Daily participation by an owner or family member is highly recommended and will generally produce better financial performance for a franchise. How do I choose a location and will Papa Ray's Pizza Franchise help in site selection? The ideal site is a high traffic in-line strip shopping center with a "draw" located in the center. Many prospective franchisees already know of such a location. If you do not have a location in mind, you can use our experience and contacts to assist you in selecting a site. Where do I purchase equipment and supplies? We have developed a network of suppliers for our equipment and other items. These approved suppliers can provide you with all items that meet our specifications and standards. How long will it take to open a franchise? The time necessary to open a franchise varies from location to location depending on the local health department and city permitting. Once a lease is signed, it takes approximately 30 to 120 days.